Ref. earnings: 25% from faucet claims/10% from offerwalls forever. 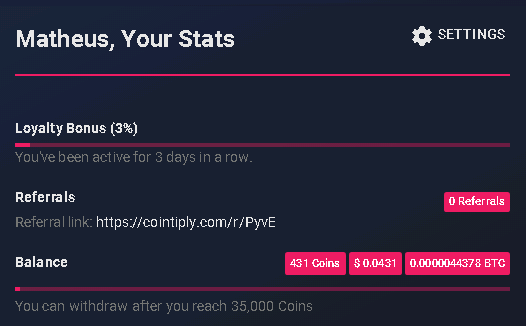 You can win a bit more coins playing games. Are there any fees for withdrawing? No. At this time, you will NOT be charged any withdrawal fees for Direct Bitcoin, Faucethub or DOGE withdrawals. 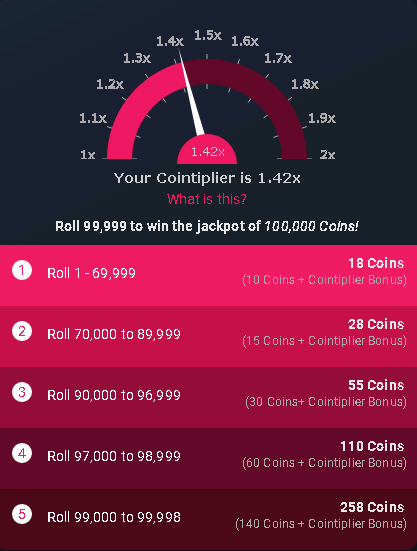 The Cointiplier enables you to earn more based on overall activity on the site. Everything you do from claiming to bringing refs, boosts the cointiplier. Hope you enjoy it! Cheers. Looking really nice and smooth. The support response was inspiring. Yes this is a nice place. Sorry was already member when you post here. Didn't get paid for now. I assume my user ID is JAKB ? Can you confirm in your referral list ? I see it has a mining game as well similar to cryptomininggame, not sure how it works. Anyone made withdrawal yet ? Because I see value of coins is pretty high. Thanks for joining me Raz0r! Yes, the mining game seems nice. I bought one 2.5k coins thing and pat it there. It's not that efficient but gives a nice idea. I think I'll get a 25k coins one instead of withdrawing upon reaching 30k coins. Would only withdraw if my refs REQUIRE proof. Sounds like a plan to invest in the mine tho. Yes I would like to request to make an attempt of withdrawal. I apologize if it disturbs your plan but I just want to know whether its paying or not. 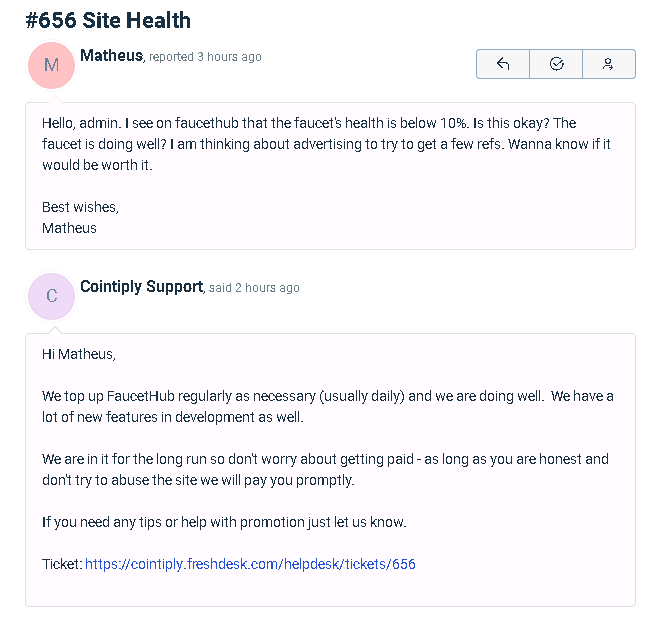 You can directly look at faucethub to know if this is paying or not. 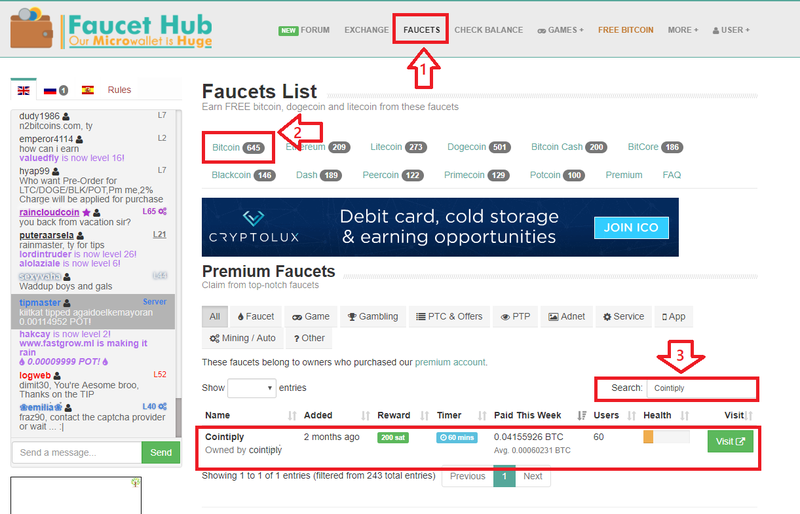 Don't forget often faucets owner send more crypto to they faucethaub account , and caution when it's the first day of the week , you can do not find it if no members have requested a withdraw.